After describing Healthcare.gov as the biggest tech failure in government because “it just didn’t really gel and there wasn’t enough testing,” Hillary admitted (in an apparent non sequitur) the government doesn’t do a good enough job protecting its own data. We are woefully behind in the government in even protecting our own stuff. And so we’ve got to do a better job if we’re going to be a good partner with businesses to try to maintain privacy of data, whether it’s just customer data or whether it has real public consequences. She then pivoted from what (I thought) was a project management issue, not a security one, to a long answer on the Apple v FBI that basically admitting not knowing (or being willing to say) what the right answer was. With respect to the current legal controversy, between Apple and the FBI, I am someone who is just feeling like I am in the middle of the worst dilemma ever. I mean, think about it. Because there’s got to be some way to protect the privacy of data information. There’s got to be some way to avoid breaking encryption, however you describe it, and opening the door to a lot of bad actors. But there also has to be some way to follow up on criminal activity and prevent both crimes and terrorism. You guys are the experts on this. I don’t know enough about it to tell you how to do it. But I think that the real mistrust between the tech companies and the government right now is a serious problem that has to be, somehow, worked through. I keep saying, you know, we have a lot of smart people in this country. You know, we invented the Internet, we invented, you know, the Internet of Things, we’ve invented all of this. Isn’t there some way without opening the door and causing even, you know, more and worse consequences to figure out how you get information? Because I’m also very understanding of the position that law enforcement finds itself and and if any one of you were working at Quantico in the FBI lab, and you know, you had this phone that one of the terrorists in San Bernardino did and you wanted to find out who they communicated with and you know that could trace us back to somebody in this country, it could trace us back more clearly to somebody directing it overseas. You’d want to know that too. So that’s what we need help on, so that we don’t make a grave error that affects our ability to maintain privacy and to protect encryption, but we also don’t open the door — because we know what happens, is these guys that are on the other side of us now, with ISIS and the like, they are really smart. A lot of them are well-educated. They’re not the image of just some poor guy coming to be a Jihadist. They are educated, they are increasingly computer literate, they are wanting to wage as much war and violence on Europe, the United States, as they can. They have learned, so they’re now using encrypted devices, why wouldn’t they? You know why would they be so stupid to continue to allow us to monitor where they are and what they’re doing? This is a problem. And it’s a problem we’ve got to come up with some way to solve. But I certainly am not expert in any way to tell you how to do it. 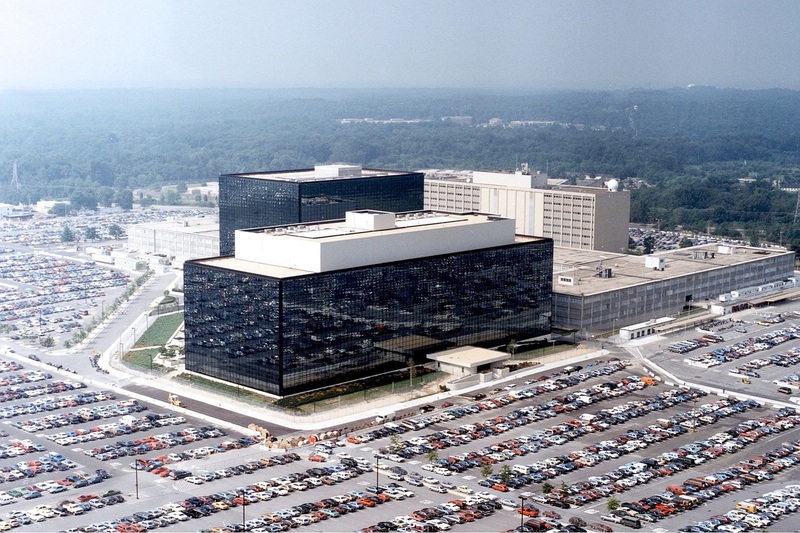 Even before the government obtained an All Writs Act ordering Apple to help back door Syed Rezwan Farook’s phone, it had arranged with a former judge to submit a brief on behalf of the victims of the attack, supporting the government’s demand. Yet not all victims agree. The husband of a woman shot three times in the attack, Salihin Kondoker, has submitted his own letter to the court in support of Apple’s stance. In it, he provides support for a point I was among the first to make: that the phone isn’t going to provide much information about the attack, in large part because it was a work phone Farook would have known was being surveilled. It’s a question no one asked Jim Comey earlier this week when he testified before the House Judiciary Committee. Curiously, Kondoker (who explains he has attended briefings the FBI has held for victims) alludes to information the FBI is currently ignoring. In the weeks and months since the attack I have been to the FBI briefings that were held for victims and their families. I have joined others in asking many questions about how this happened and why we don’t have more answers. I too have been frustrated there isn’t more information. But I don’t believe that a company is the reason for this. I’m really curious what that is — and why Jim Comey, who promises he would never ignore a lead, isn’t ensuring it gets chased down? 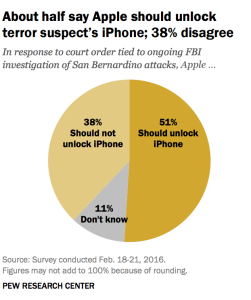 In my post on Pew’s polling on whether Apple should have to write a custom version of its operating system so FBI can brute force the third phone, I gave Pew credit for several aspects of its question, but suggested the result might be different if Pew had reminded the people the FBI has already solved the San Bernardino attack. As I said, at least Pew’s question was fair. Do you agree or disagree with Apple’s decision to oppose the court order? While Reuters explains why Apple opposes the order — because it will be [in fact, already has been] asked to help break into more phones that have nothing to do with terrorism, creating vulnerabilities for hackers — the wording of the question could easily be understood to imply that Syed Rezwan Farook’s phone “was used  in the San Bernardino attack.” It’s not clear Farook even used the phone after November, two days before his attack. And to the extent Farook and his wife used phones during the attack — as implied by the question — they are believed to be the phones they tried unsuccessfully to destroy. 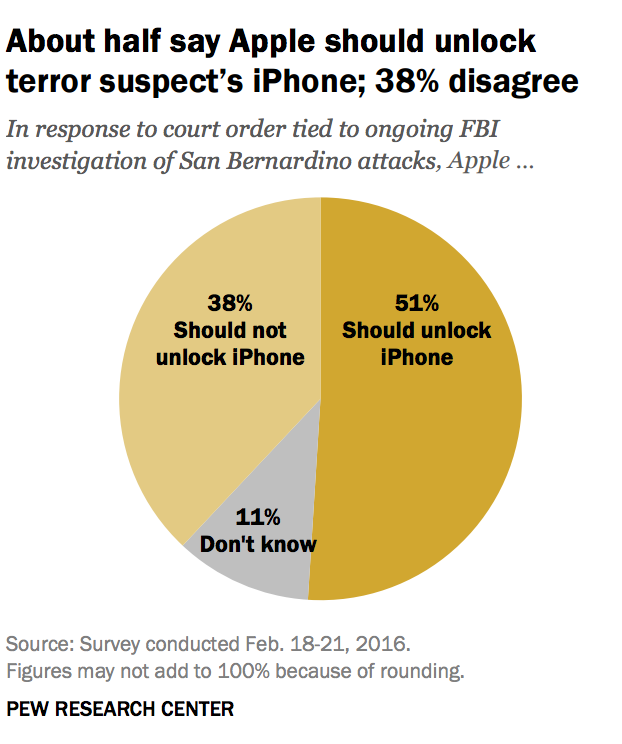 Yet, even with his problematically framed question, 46% of respondents (on an online poll, which likely skews towards tech facility) supported Apple’s actions. There’s a problem, too, with the only question for which a plurality supported the FBI’s snooping. a graph of which Reuters highlighted in its story. The government should be able to look at data on Americans’ phones in order to protect against terror threats. There are cases where investigators find information on a smart phone that helps prevent follow-on attacks (in happened in Paris with a phone that was not encrypted). Border searches(which I admittedly believe to be one of the real reasons FBI objects to default encryption), too, might prevent terror attacks. But more often, we’re talking about investigating crimes deemed to be terrorism after the fact (or, far, far more often, solving drug crimes). Nothing the FBI could do with the data on Farook’s work phone will prevent the deaths of the 14 people he already killed. There are other kinds of surveillance far better suited to doing that.